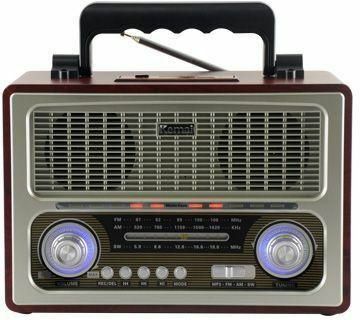 This is an Old Style Radio Shaped but inside all the things is Modern.this is Re Chargeable from Electric power and after that you can use it Outdoor and indoor and you can Enjoy listen Music via FM/AM Stereo Radio and there is SW3 band Radio too.you can Use Direct USB Drive and can listen Music.You can Use Your TF/SD Card DirectlyYou can Record Your Voice ,songs with High Fidelity Recording SystemPortable and Bass soundProduct Features1. FM/AM/SW 3 Band radio2. USB/SD/TF Card play3. Internal/external recording function4. Digital demodulation receiver5. DC 6V6. AC 220V Charger7. The built-in 1200mAH Battery8. External DX4 battery.